Poppy tea has been used for thousands of years as a home remedy as a pain reliever, sleep aid, cough suppressant, and intoxicant. Poppy tea can refer to any tea infusion brewed from dried ground-up poppy pods or poppy straw, or from whole poppy seeds. 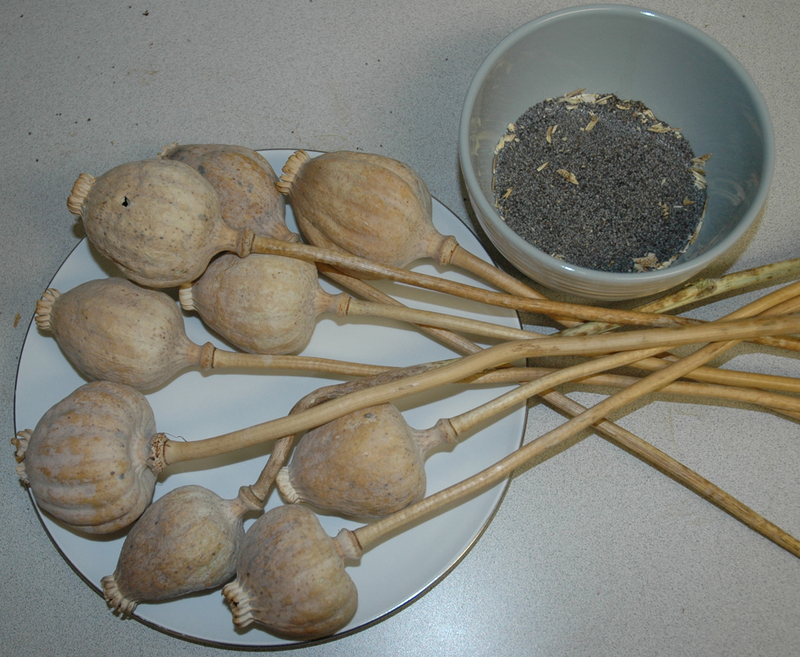 The seedpods of the opium poppy (Papaver somniferum), and to a lesser extent the stems, contain opiate alkaloids such as morphine and codeine. While the seeds do not contain any active opiates, they are often coated in opium residue as a result of the processing method of crushing the pods. This coating can be essentially rinsed off in a simply process to make poppy seed tea. Poppy tea can have a very strong bitter taste when brewed with a batch of pods or seeds that contain large concentrations of alkaloids. Lemon juice, honey, spices, or other flavorings may be added to make the tea more palatable. The effects of poppy tea are similar to other opiates, ranging from a light relaxation and sleepiness to strong euphoria and very heavy sedation. Nausea is also very common, especially in new users. The mixture of morphine, codeine, and other alkaloids such as papaverine and thebaine make the effects of poppy tea unique among opiates. The effects of poppy tea may last for several hours, and the mixture of alkaloids may explain why the effects of poppy tea last much longer compared to just morphine. The process of brewing poppy pod tea involves grinding a number of pods into a fine powder to assist in the extraction of the alkaloids. There are several methods for preparing poppy pod tea, with most involving steeping the ground-up pods in warm water and then filtering the mixture. Poppy seed tea is brewed using large quantities of whole seeds, using water to rinse the opium residue that coats the seeds. Due to variations in processing methods and washing, the alkaloid content of poppy seeds in stores can vary greatly. Seeds which have not been washed can contain upwards of 330-515mg of morphine and 75-200mg of codeine per kilogram (~2.2 pounds) of seeds. Consuming poppy pod or poppy seed tea regularly may lead to opioid addiction. On internet forums, many addicted users report that the withdrawal from poppy tea is quite intense, and with a much longer duration than withdrawal from only morphine. The alkaloid content of both poppy pods and poppy seeds can vary greatly from batch to batch. Various factors such as the strain of poppy, growing conditions, processing methods, and whether the seeds have been washed can all affect the alkaloid content in both poppy pods and poppy seeds. For this reason, it is important to be extra careful when consuming poppy tea as you can't know for sure how strong it will be. As with any opiate, overdose is possible, and there have been cases of overdose deaths from both poppy seed and poppy pod tea, though it is unclear in these cases whether alcohol or other drugs may have played a role in causing the overdose. In South Asian communities across North America, a poppy tea brewed from ground poppy pods and poppy straw called 'doda' (also 'dode') is quite popular. Dried poppies are used in flower arranging and are commonly sold in flower shops and craft stores. In some Punjabi-Canada communities, dried poppies are also sold in flea markets and food shops, though police have recently been cracking down on these sales as selling dried poppies for purposes of consumption remains illegal. Poppy tea is not produced commercially. Users brew poppy tea using either dried poppy pods or poppy seeds. Dried poppy straw, the parts of the poppy other than the seedpod (i.e. the stem), is sometimes used as well. * Poppy tea is used a home remedy for treating pain, as a sedative, and for treating diarrhea. has a half-life of 2-3 hours. Effects from drinking poppy tea can last for several hours. the seeds can vary dramatically. seeds). In 2008, a Canadian man was prosecuted for growing opium poppies to brew poppy tea or personal use. Morphine is a naturally occurring opiate found in the opium poppy. Read about morphine brand names, street names, formulations, medical uses, chemistry, legality, and other information. Codeine is a naturally occurring opiate used as mild narcotic pain medicine. Read about codeine brand names, street names, formulations, medical uses, chemistry, legality, and other information. Discover the history behind opiates, learn the difference between opiates and opioids, and read about where they come from.